"The Bizoton Affair" by Laënnec Hurbon, Ph.D.
Hurbon is Professor of Theology and Sociology at the Centre National de la Recherche Scientifique in Paris and at Quisqueya University in Port-au-Prince. He has written numerous books, such as Le barbare imaginaire (1988) and Voodoo: Search for the Spirit (1995). As president of the Republic of Haiti from 1859 to 1867, Fabre Nicolas Geffrard inherited the project of advancing reconciliation between the Haitian state and the Vatican, a subject which since the year 1820 had been the object of long years of negotiations. During this time period the Catholic Church was seen as the one international institution capable of recognizing Haitian Independence due to the fact that the European powers as well as the United States had at that time refused to condemn slavery. Becoming independent in 1804, Haiti was seen as a dangerous example for other Caribbean colonies. The signing of the 1860 Concordat was therefore considered a diplomatic victory for Haiti, and Catholicism became the official state religion with the mission of diffusing Christianized western civilization through education and scholarship administrated by predominantly French religious congregations (Peres du St. Esprit, Frères de l’Instruction Chrétienne, Sisters of St. Joseph of Cluny); as well as purging the culture of its African traditions such as Vodou, widely regarded in Europe as a vestige of more primitive societies. 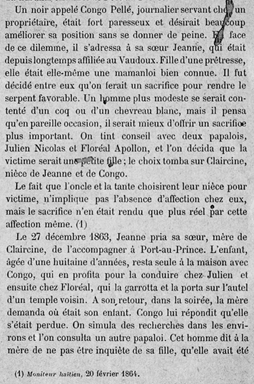 In December 1863, just outside of Port-au-Prince, at Bizoton, a young woman, Jeanne Pelée and her sister Congo Pelée, a Hatian Vodou priestess, decided to sacrifice their own niece, a young girl, as part of a religious ceremony. Rumors of cannibalism quickly spread throughout the capital, reigniting old fears and concerns. Under torture, admissions of guilt were soon obtained and eight suspects were summarily charged as accomplices and condemned to death. The newspaper Le Moniteur of Februrary 29th 1864 relates this occurrence in greater detail, describing Haitian Vodou as "a barbaric cult... imported from the dark corners of Africa". The Bizoton Affair served to reinforce existing preconceptions about Haitian Vodou and paved the way for later criticism and inquisitions, aimed at once and for all ridding the island of the practice. Sir Spencer St. John, the former British counsel for Haiti, serves as a historic spectator of daily life in the cities and countryside of nineteenth-century Haiti. 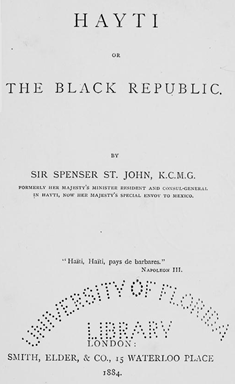 His observations were published in the book, Haiti or the Black Republic (1884). Within this book one finds intriguing accounts of cannibalistic practices, human sacrifice and sorcery, all of which are condemned as practices that must be abolished for Haiti to become part of the civilized world. This book was translated into French and became very popular, among other incidents it relates the occurrences of the Bizoton Affair in good detail but lends itself to the flourish and speculation of its age. Also, the work served to reinforce the vision of a nation steeped in a primitive tyranny caused by the continuing practice of Vodou. One the of principle characteristics of cannibalism is its capacity to immediately conjure up the assumed opposition between uncivilized and civilized societies. Cannibalism in Haiti was at first attributed to those Amerindians who resisted sixteenth-century European conquest as well as African tribes associated with early European colonization efforts. The more contact Europeans had with these new cultures, the more stories circulated. Because of a very superficial knowledge of the religion, Haitian Vodou very often became the object of nineteenth-century criticism. Outside of the fantastic imagery created by these early assessments, cannibalistic concepts in Haitian Vodou are generally associated with magical properties and traditional representations of the ability to devour other’s psychological being. Contrary to these early ideas, in areas where cannibalism has played a cultural role, it is often part of a very developed and complex belief system.